Recently Tammy Strobel interviewed me for her blog, Rowdy Kittens. I’ve known Tammy for a couple years now, through the tiny house movement. Tammy’s life & work is focused on the topic of simple living and she currently lives a car-free minimalist life up in Portland, Oregon. 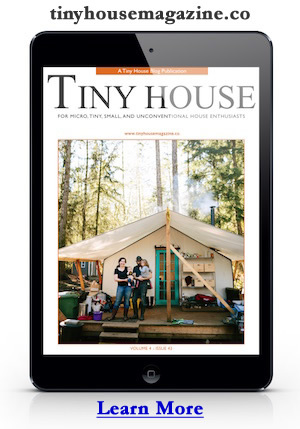 It might seem a bit self-promoting to mention the interview here, but who knows… maybe some of my regular readers are curious to hear a little more about why I blog about tiny houses, my future plans, values, and motivations. This entry was posted in Announcement and tagged michael janzen, Rowdy Kittens, Tammy Strobel, tiny house design. Thanks for sharing that with us. Interesting insights into your motivations and talents. It is folks like yourself that move this ‘community’ forward by informing and inspiring. Nicely done. Actually it’s not self serving. I wonder why you have never expressed those ideas here on your own blog. I’ve been reading for years and I’ve often wondered, what’s in it for you. I think the bigger picture of the tiny house movement is far more interesting to me than the actual houses. People are craving a change. Things in this world are just not right. We aren’t wealthy, we aren’t happy, we’re busier than we’ve ever been and there has never been job security( if you believed that there ever was, then you were sucked into the big lie). Even voting Obama has done nothing since he’s controlled by corporate interests and the job of president is no longer to run the country but to piss off the least amount of powerful people to ensure re-election. The tiny house movement is a reaction. Whether or not it is the movement it takes to change the world, I doubt it…but it’s an outlet for action and to take back control of one small aspect of our lives. Is it enough to save the planet? Not a chance. I see some tiny house designs that are basically the wasteful designs of large houses in a smaller form. In any case, you’re a part of it, mate and it’s an important step, though just the first. I enjoyed the interview. Understanding the motivation behind the blog and the projects improves the experience. Also a closet architect but never took a single course. I wonder if you are familiar with The Rural Studio and what you think of their designs and methodology. Take care. I’m not familiar with it… looks cool though. Yes, that is the correct Rural Studio. The University website, http://cadc.auburn.edu/rural-studio/, has pictures from all their projects over the years. I like the hands on approach and that students are interacting directly with the building users.